This creamy shrimp spread is so delicious, your guests will never guess that it uses reduced-fat products. Preheat oven to 350°F. Mix all ingredients except crackers. Spoon into 1-1/2- to 2-cup ovenproof casserole dish. Bake 20 to 25 min. or until heated through. 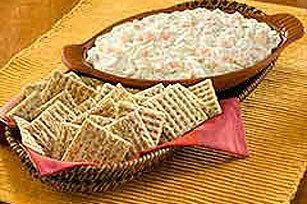 Serve as a spread with the crackers. Prepare as directed, using PHILADELPHIA Light Cream Cheese Spread. Prepare as directed, using rosemary and olive oil woven wheat crackers. The spread can be mixed up to 1 day ahead. Cover and refrigerate until ready to bake as directed. Uncover spread before baking.